Patrick Henry O’Rorke was born in County Cavan, Ireland on March 25, 1837. His family emigrated from Ireland when Patrick was but a year old, eventually settling in the “Little Dublin” neighborhood of Rochester, N.Y. An excellent student, he earned one of two scholarships to the newly formed University of Rochester. However, his father’s sudden death required young Patrick to take a job as a marble cutter to support his family. so that they would graduate with the class of 1861. 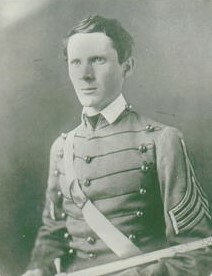 Despite having to cram the final years’ worth of studies into six weeks, O’Rorke, the first Irish immigrant to graduate West Point, finished first in his class. As an aside, his better-known classmate George Armstrong Custer finished last. O’Rorke was appointed to the prestigious Corps of Engineers. O’Rorke was at the First Battle of Bull Run where the new lieutenant had his horse shot out from under him. He then was assigned as an engineer to help prepare the defenses of Washington D.C. from what was feared would be an imminent Confederate assault. Later, he served with such conspicuous distinction during the siege of Fort Pulaski on Cockspur Island near Savannah, Georgia that O’Rorke was given the high honor of being one of the officers to receive the Confederate surrender of the fort. This put O’Rorke in a dilemma. 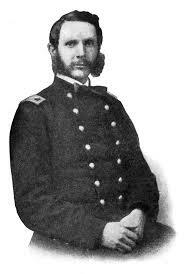 O’Rorke had no obligation to follow Warren’s orders countermanding his Brigade Commander. If things went badly in the Wheatfield, O’Rorke could be held responsible and face Court Martial and ruin. Warren’s well-meaning assurance to “take the responsibility” would matter little if Warren should be killed in a battle that had already claimed so many lives. O’Rorke did not hesitate. Warren’s aide and fellow New Yorker George Washington Roebling, who would later build the Brooklyn Bridge, guided O’Rorke and his men as they scrambled up the steep hill; already exhausted from the forced march and oppressive July heat. Reaching the top, O’Rorke saw the line of 16th Michigan beginning to crumble. Without pause, O’Rorke drew his sword from his scabbard, and yelled: “down this way, boys!” The lead elements of the 140th plunged over the side and “went in with a cheer,” following their Colonel to be met with a devastating volley from the advancing Confederates. O’Rorke grabbed the regimental flag and turned to urge his men forward when a bullet ripped through his neck. Patrick O’Rorke was dead before he hit the ground. He was 26 years old. Harry Pfantz, the Chief Historian of the National Park Service, wrote that “O’Rorke’s five hundred men tipped the scales heavily in the defenders’ favor.” The Union would hold Little Round Top and defeat the Confederates. In his history of the American Civil War, the Comte de Paris would describe O’Rorke’s actions as one of the most striking and dramatic episodes of the battle. 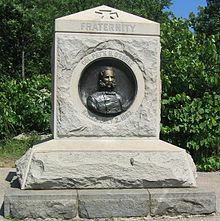 Col. Joshua Chamberlain and the 20th Maine would earn just immortality for their actions on Little Round Top later in the day. However, the actions of Chamberlain and the 20th Maine would not have been possible without O’Rorke, and the 140th NY; their deeds should be equally remembered and honored. Postscript: O’Rorke’s young widow Clara Bishop would take her vows as a nun of the Society of the Sacred Heart and have a distinguished career as an educator and foundress of several schools.